This morning’s jobs report showed that the economy added 134,000 jobs in September. While this is down from the 270,000 jobs created in August (higher than initially reported because of sizeable revisions), it’s likely that this below trend topline number is partially due to Hurricane Florence, which made landfall during the reference period for this survey. Over the last three months the labor market has added 190,000 job per month on average, which is likely closer to the underlying trend. Nominal wages grew 2.8 percent year-over-year, roughly in line with inflation, and the unemployment rate fell to 3.7 percent. The fall in the unemployment rate is largely due to the “right” reasons: people finding work (i.e. not because people gave up looking). All told these data paint a picture of an economy that is moving towards full employment, but one that is not there yet. Wage growth continues to lag behind a reasonable target, key indicators like the prime-age employment-to-population ratio (unchanged in September) show we have much more room to pull workers in off the sidelines. 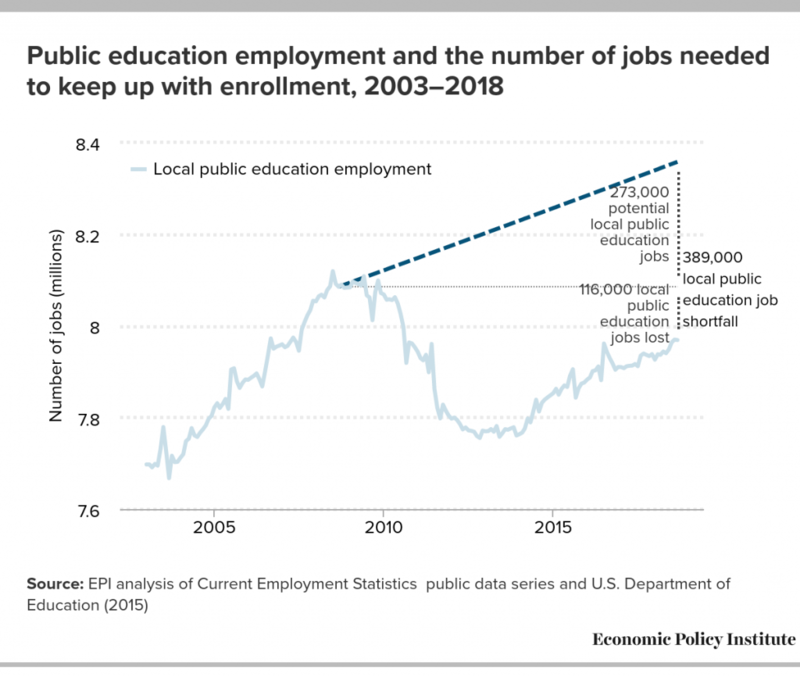 Meanwhile, September’s report gives us data to examine the “teacher employment gap”—the gap between local public education employment and what is needed to keep up with growth in the student population. State and local government austerity since the recession has contributed to a significant shortfall in education employment. There are still 116,000 fewer public education jobs than they were before the recession began in 2007. If we include the number of jobs that should have been created just to keep up with growing student enrollment, we are currently experiencing a 389,000 job shortfall in public education. The consequences of this employment gap are clear: larger class sizes, fewer teacher aides, fewer extracurricular activities, and changes to curricula—and, as made clear by the numerous strikes over the last year, teachers suffer from subpar wages and working conditions.